Event Management Company based in Bridgend, South Wales. Contains technology to prevent the downloading of pictures. 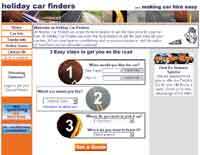 Holiday Car Finders are a car rental agency based on the costa blanca. Site uses a CMS to keep prices and cars easily updatable. Contains a powerful hire car quote tool developed by Hex Design. Estate Agents based on the Costa Blanca. They provide Resale & new builds and air conditioning. Uses Hex Designs content management system (CMS).